Today we have an edible Christmas craft. 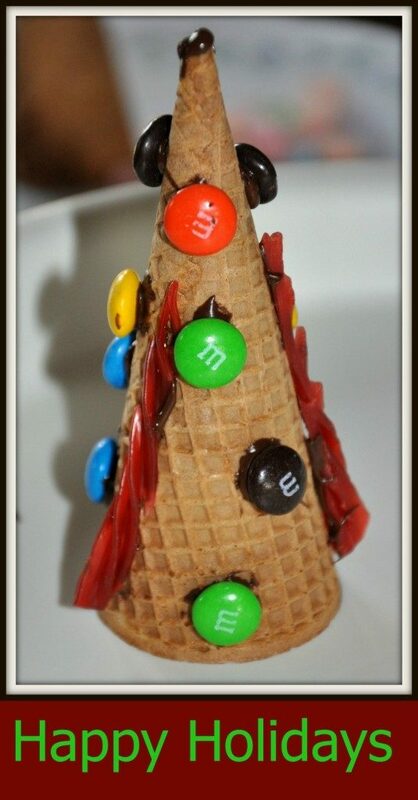 An utterly delicious Christmas tree from sugar cones. It is a popular Christmas tradition in many families that we decided try this one at our house. 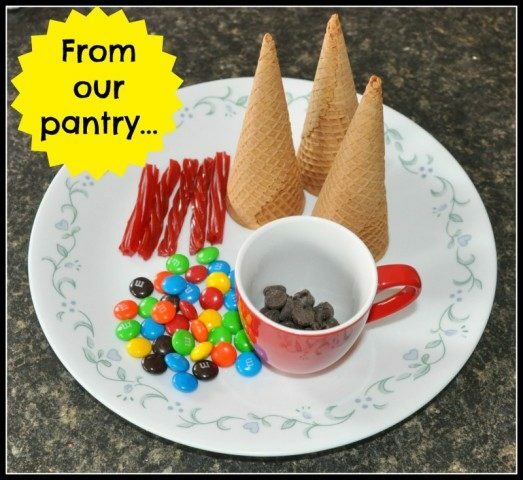 I just omitted the frosting on the cones since I wanted my pre schooler to try this edible craft independently. She is my petite chef and I did not want to constantly tell her to go easy on the frosting. So bring out those hidden Halloween candies because this one is for you. Christmas trees are one of the first signs that the season has begun and this cooking project is easy and entertaining that kids are gonna ask for more. It is completely edible and makes for a yummy treat and perfect for the Christmas season. Melt the chocolate chips in the microwave. Time varies based on the wattage. It took 20 seconds for me. You can always put it back in for a couple of more seconds, but do so with increments of only 10 seconds every time . You don’t want to burn the chocolate. That is our edible glue for our edible craft. 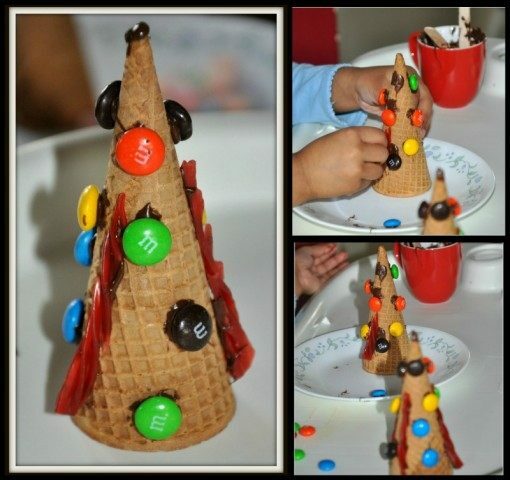 Use craft sticks to spoon the melted candy to the cone and use M & M’s and Twizzlers as ornaments to stick to the melted chocolate. When done put it back in the fridge for the chocolate to harden. You can also make these ahead and store it in the freezer for a fun treat to celebrate the joy of the season. Now all you need is a big bucket of Ice-Cream ! We encourage you to stick around and take a look at couple of our popular posts. How fun and yummy!! Thank you for sharing at Sharing Saturday!! Thank you for featuring us !